Luis Angel Rosadilla, a special envoy from the Organization of American States (OAS), told a news conference that President Daniel Ortega's government had agreed to release "all the people detained in the context of the protests". "A call will be made to the international community to suspend sanctions to facilitate the right to the human, economic and social development of Nicaragua, favouring the most vulnerable sections of the population," the statement said. The Civic Alliance for Justice and Democracy (ACJD) said on Tuesday talks would not resume until all "political prisoners" were freed. 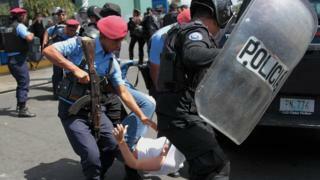 Unrest started in April 2018 when demonstrations against changes to the country's social security system widened into calls for the resignation of President Ortega, who has been in power for the past 12 years. Talks to find a solution broke down after President Ortega ruled out calling early elections - the opposition's chief demand.